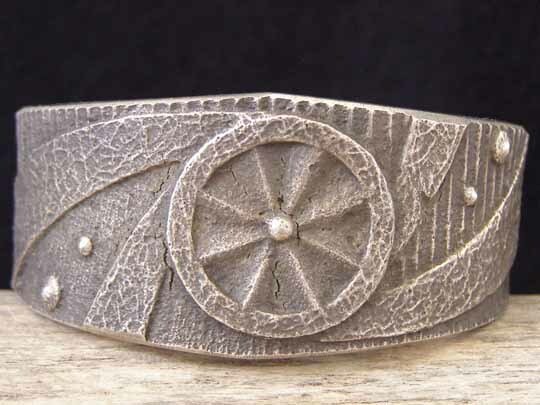 Anthony Bowman Sandcast Bracelet size 6 3/8"
This is a classic Navajo sandcast bracelet handmade by Navajo silversmith Anthony Bowman. The texture of the tufa stone in which the mold was carved for casting is readily apparent in the stippled surface of the silver. Each of Anthony's pieces is cast in a mold which only works one time and then is discarded; so every single piece is a one-of-a-kind creation. This bracelet depicts a whirling Medicine Wheel. His bracelets are hefty because he carves his molds deep in the stone and this requires more molten silver to fill his molds. You'll love the solid feeling to his pieces. This piece shows carved bears on the inside of the bracelet. Hallmarked A J Bowman and stamped Sterling inside. Width in front: 1 3/16"